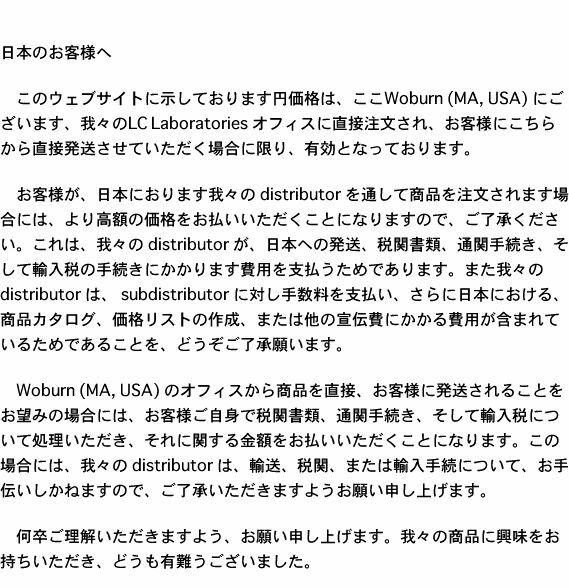 To our customers in Japan: the Yen prices here on our website only apply to orders placed directly to our LC Laboratories offices here in Woburn, MA, USA and shipped from here directly to you. Alternatively, if you order our products from one of our distributors in Japan, you must expect to pay substantially higher prices. This is because our distributors pay for shipping to Japan, customs paperwork and clearance, and import duties. Our distributors also pay commissions to subdistributors and, in addition, they pay for preparation of catalogs, price lists and other publications in Japanese. If you order products to be shipped directly to you from our offices here in Woburn, MA, USA, you will need to handle and pay for all customs paperwork, clearances and import duties. For direct orders like these, our distributors cannot assist you with transportation, customs or import procedures. We thank you for your understanding. Thank you for your interest in our products.